As it’s name describes it, topsoil is the top layer of the soil or upper surface of the land, depending on how rich the soil is and the use given to the area prior to excavating, this layer can vary in thickness from 2-12 inches. Topsoil has the highest concentration of nutrients and organic matter of any soil, making it an essential product for landscaping, gardening and farming. At plain sight top soil can be differentiated from regular fill dirt by its dark, rich color. 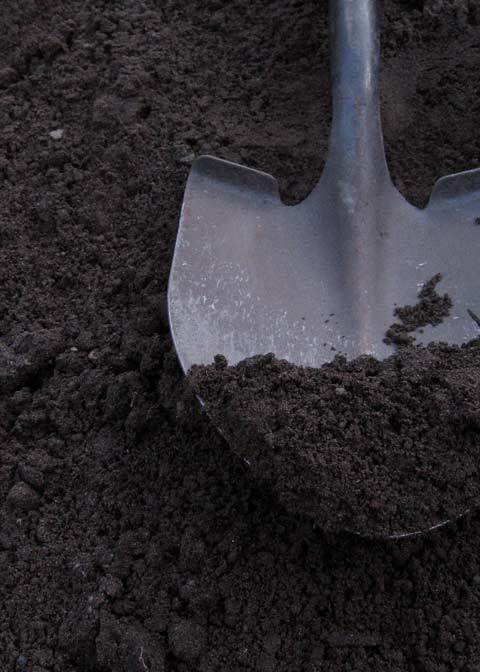 Topsoil can be put through a sieve to remove any, naturally occurring, sticks or roots, the resulting soil is referred to as screened top soil. As can be expected having this additional process adds to its cost. Unscreened topsoil on the other hand is used as is, the way the material is excavated from the ground. Many of our customers prefer screened topsoil for gardening, planting, or as a base before putting down new sod. Pricing for topsoil varies depending on the delivery address and quantity ordered. We can deliver top soil in quantities ranging from 1-18 cubic yards per load. You will receive the best price per yard when ordering a full truckload. A general rule of thumb when trying to determine how much topsoil you need is as follows: 1 cubic yard will cover an area 10′x10′ (100 square feet) to a depth of 3″.